We like the BMW 5 Series because it does a better job at blending an executive ambience with driving pleasure than the competition. If you are also interested in how a car drives as well as looks, the biggest headache is picking between the BMW and the Jaguar XF. However if you want a plug-in hybrid (and why wouldn’t you!) that decision just got a whole lot simpler. BMW makes one and Jaguar doesn’t. 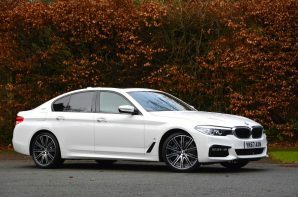 We already know that the 5 Series ticks all the relevant boxes; it is well appointed, comfortable, quick, has all the executive toys (if you raid the options lists) and looks the part. It is also great to point down an interesting bit of road but is still capable demolishing motorway miles with consummate ease. So the real question is, what does the hybrid bit add? Well the simple answer is an extra 94 bhp and 184 lb ft of torque courtesy of the electric motor, and the theoretical ability to cover up to 28 miles using electrical power alone. The conventional bit of the drivetrain is provided by a 4 cylinder 2 litre petrol which chucks out 181 bhp all by itself. Both units can operate independently or jointly but power is always routed through an 8 speed auto ‘box to the rear wheels. So what’s it like in practice? Very good since you ask. The two systems are well integrated which hides the internal power struggle that some rivals struggle to mask. Performance is brisk and when in EV mode progress is also serene. On paper you can cover 28 miles with a full battery, but we found somewhere between 17 – 25 miles to be more achievable. In addition to testing the EV range we also checked out the fuel consumption and recorded 50 mpg on a steady motorway run. Across a mixed week of driving (including short electric trips) we average 47 mpg. Very respectable figures for a big petrol executive car, and if you mostly travel less than 20 miles between plug-in opportunities you could use little to no petrol at all. Any downsides? The 9.2 kWh battery sits under the rear seat and reduces boot space from 530 litres to 410 litres whilst the fuel tank has also gone on a diet and its 46 litre capacity does restrict the touring range. Other than that the kerb weight is at the upper end of acceptable and you will have to fork out a bit more dosh at the BMW dealership. As long as you are planning to plug-in as much as possible to maximise EV running there is much to like. As with all plug-in hybrids if you have no intention of recharging the battery, look elsewhere, but driven as intended the addition of a useful EV range adds a new dimension to the 5 Series and offers the potential of massive running cost savings.